The third generation of the Huawei Watch, which may be named the Watch GT rather than the Watch 3, is the subject of new image leaks at WinFuture. The watch may have a larger display than its predecessor, and may have more than one version. It has also reportedly been approved by the FCC. 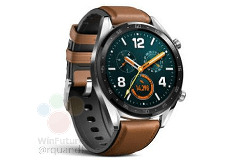 The tech correspondent Roland Quandt has posted images that, he claims, show the design of the Huawei Watch GT. This, apparently, is the name of the Chinese company's Watch 2 successor. Quandt claims that this Watch GT will come with a 1.39-inch AMOLED display, which would be a improvement over the older model. This display may also have a higher resolution compared to last-generation smartwatches. The alleged Huawei Watch GT may also be powered by the Snapdragon Wear 3100 platform. This new chipset may bring enhanced battery life, as well as many other features such as improved GPS and user interaction, to the upcoming wearable. The Watch GT is also thought to come in more than one variant, one of which may be in a 'classic' or 'fashion' style, and another that may be intended as a 'sport' version. Quandt also asserts that the Watch GT will also be water-resistant, although it is not clear if this feature will extend to all variants. He also estimates that it will cost approximately US$230 to $265, depending on SKU. The Huawei Watch GT has also reportedly been approved by the US Federal Communications Commission (FCC), and may be released alongside the Mate 20/20 Pro soon.